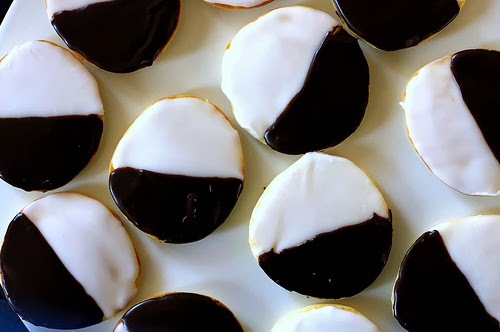 I'm a big fan of black and white cookies ever since I lived in NYC where they are in all the bakeries. I made this recipe from Smitten Kitchen last year for our New Year's Eve party and was really happy with how they turned out. The cookies are really more like cake with a vanilla and chocolate frosting - the best of both worlds! By the way, if you aren't already following Smitten Kitchen, I highly recommend you do. One of the best food blogs ... period! Have a sweet & Happy New Year!